Each morning I pour birdseed into a bird feeder on my patio. Big windows reveal the outside action to my cats somewhat like a movie screen. The action begins slowly. One sparrow sits on the fence waiting for another to come. A couple more arrive. They too wait. Then when the entire group is in attendance as if on que by a film director, they swoop into the bird feeder with great abandon. Chattering. Nibbling. Flitting from one side to the other as if dancing to a song only they can hear. Such happiness they exude. My cats sit with their eyes glued to the action and remain entertained until the birdseed is apparently all consumed and the last bird flies away. What is amazing is that the sparrows do not seem to fight for the seed. They share. They wait for the others to show up for the morning breakfast. They share the joy of the dining table. They seem to be telling tales of the previous day with such pleasure. Perhaps their discoveries while flying from here to there and then home again. Where ever home is. Sparrows seem to be a bird we do not seek out to watch. To follow. They do not command attention as a blue jay or a cardinal. They fit into the environment both with the colour of their feathers and the manner in which they conduct themselves. I don’t believe I have noticed a nest for a sparrow. Now that they are morning visitors I wonder more about them. Where do they hang out. Will they be here through the winter months. Were they born in this area or did they have a long flight to arrive. What makes them want to call this home for a while? The lovely part is they are just so happy. So together in their enjoyment of the seed. The breakfast. They seem almost respectful of the others and take turns eating then move away to allow others to eat, then come back again. They flutter around one another with no nipping, no fighting for space, no territorial movements to establish their space. They share. They seem to laugh a lot and they bring great joy to the morning with their happy chatter. It is a great way to begin the day if one does not have the ocean to walk or the seagulls to hear overhead. It is a great way to bring joy to the morning both to the cats and to me. It is uplifting to see such camaraderie. 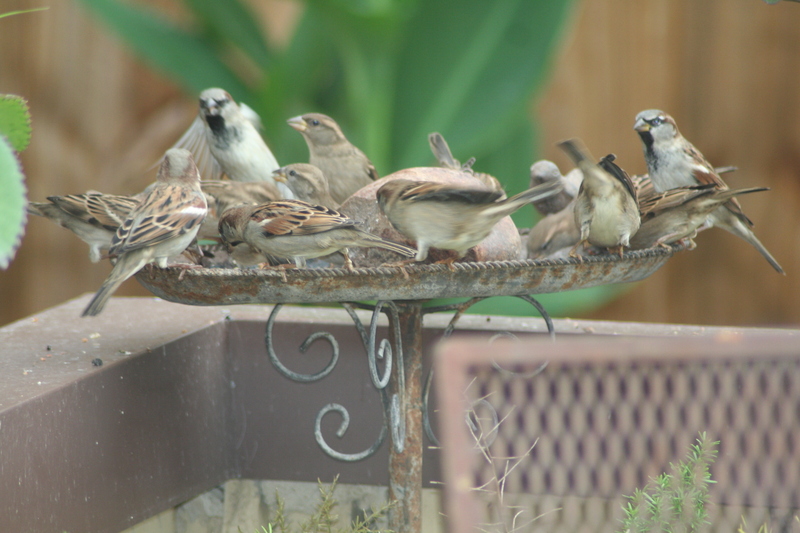 The sparrows offer a form of hope that many can truly get along in a tough environment. That if they share, they all will be happy. If they share, then all will survive. It is a lovely concept that natures seems to present in the sparrow and one that perhaps should be considered by people. They move out of the way when a squirrel hops onto the feeder eating the corn, sun flower seeds, all the while talking among themselves. Perhaps they are concerned he will consume all the seed yet they do not seem so. 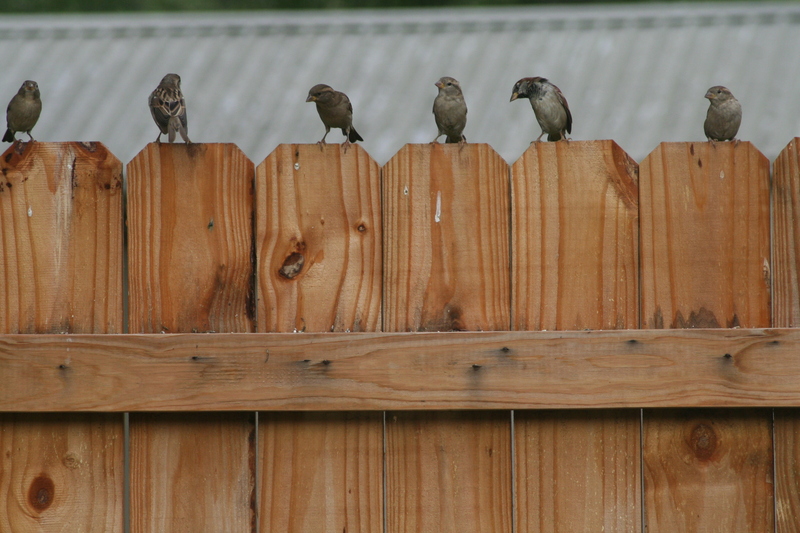 They sit on the fence, wait…then when he has his fill, return to the seed to finish the morning. And so it is the morning show presented by the happy sparrows. No negative news. No fighting. Nothing to upset their happiness. No undermining of their neighbor. Just the simple demonstration of gratitude for the seed set out for them each morning. And in turn I am grateful they provide such joy. Such hope, such peace. It is truly a lovely, uplifting beginning to the day although I think each morning if only the world could be as happy, as considerate of one another, as sharing as the sparrows, what a beautiful place this would be and how simple the concept. Share, care and be. This entry was posted in Uncategorized and tagged birds, consideration, gratitude, happiness, joy, Mornings, Nature, peace., sharing, sparrows. Bookmark the permalink.